Investing in US economy can be done through mutual fund. Majority of investor's asset portfolios are invested in US Domestic Stock mutual funds. 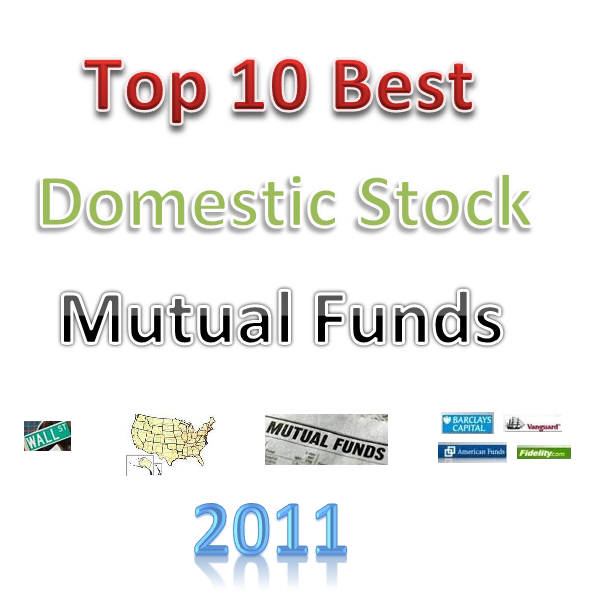 The following Top 10 Domestic Stock Mutual Funds of 2011 are Oceanstone fund, WorldCommodity, Delaware Healthcare A, Fidelity Select Retailing, Yacktman Focused, and more. Details can be found below. The fund can provide asset diversification for investor. Diversification is important in investing world. It also provides a low cost opportunity to invest in variety of US companies. Investor has an opportunity to invest in the US most successful companies. Over the long term horizon, stocks have provided higher long term returns in term of total return, including dividend and capital appreciation. The fund has performed consistently for the past 3 years and long term. It includes variety categories such as large value, large blend, large growth, mid cap value, mid cap blend, small growth, natural resources, financial, health, real estate, equity energy, industrials, etc. Note: Some of these funds may have smaller assets than other funds. These smaller asset funds may be more volatile than other funds. Details about the fund assets can be found below. Some funds can be classified as non-diversified funds. If you are interested in Top Rated funds, you can check my articles in my MEPB Financial website. 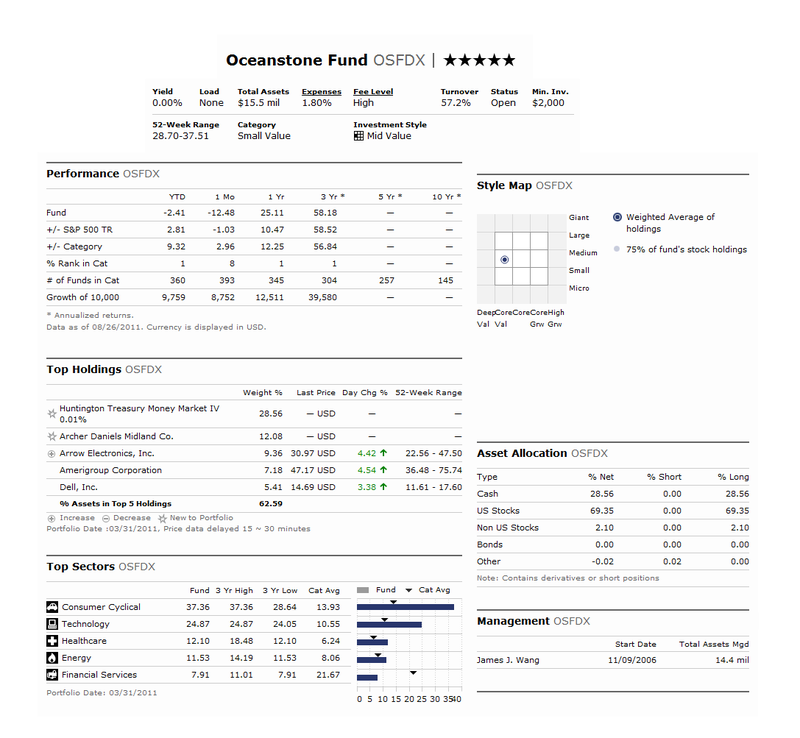 As the top rated domestic stock fund, this Oceanstone Fund seeks to provide capital appreciation. The fund invests only in undervalue common stocks on the New York Stock Exchange (NYSE), American Stock Exchange (AMEX), and NASDAQ (both Global and Capital Markets), including American Depositary Receipts (ADRs) of foreign issuers. This Oceanstone fund invests in any market capitalizations include small, medium, and large capitalization stocks. It also may engage in active and frequent trading of its portfolio securities. The fund is non-diversified. Based on the load adjusted return, this fund has returned 25.80% and 66.26% over the past three years. If you are interested in this best small value domestic stock fund, you can start investing in the brokerage account with $2,000 min balance. For subsequent investment, you can invest with $100 or more. Details about retirement accounts (IRA or 401k), please check with your account administrator. 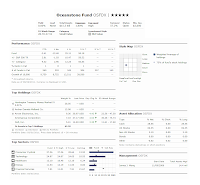 The top holdings as of March 2011 of this OSFDX fund are Huntington Treasury Money Market IV, Archer Daniels Midland Co, Arrow Electronics Inc, Amerigroup Corporation and Dell, Inc. These top five holdings represent 62.59% of the total portfolio. The top sectors are Consumer Cyclical, Technology, Health Care, Energy and Financial Services. 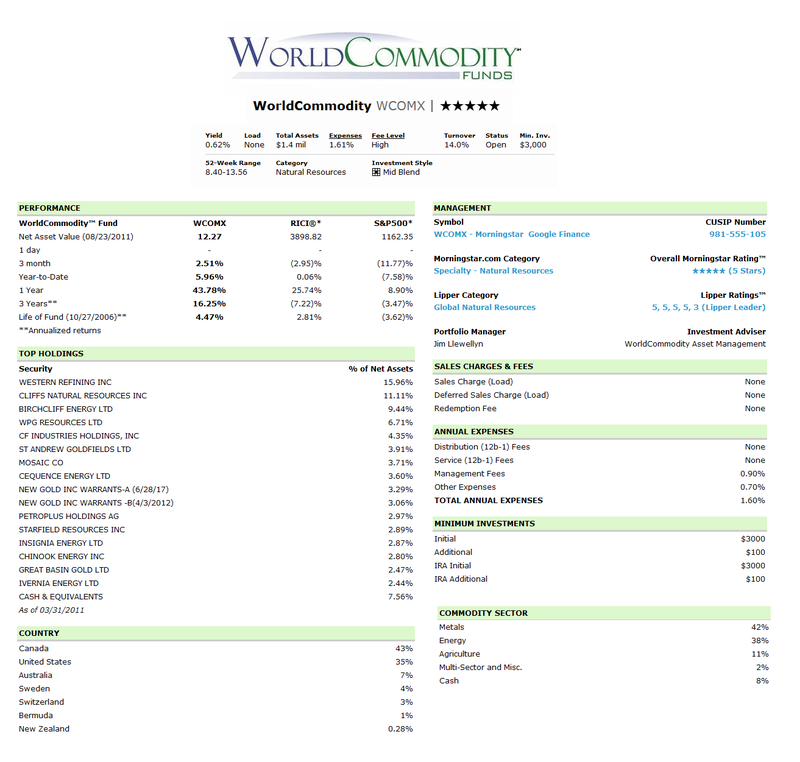 As Natural Resources stock fund, this WorldCommodity fund investment seeks capital appreciation. The fund typically invests majority of total net assets (>80%) in equity securities issued by commodity-related companies, both domestic and foreign. This fund will invest in any market value (or market capitalization). It may also invest in derivative both domestic and foreign. It is a non-diversified fund. This World Commodity Fund was introduced to public in October 27, 2006 and James Llewellyn has managed the fund ever since. This fund shares a small dividend of 0.62%. It also has an expense ratio of 1.61% per year. This figure is slightly higher than the average in the Natural Resources category (1.51%). Investor will need a minimum of $3,000 for investing in either brokerage or IRA account of this fund. There is no management fee and no sales load fee. The minimum subsequent investment needed for both accounts is $100. This fund can be purchased from a limited list of 8 brokerages. They are NPB Financial Group, E Trade Financial, Pershing FundCenter, Scottrade NTF and Matrix Financial Solutions. 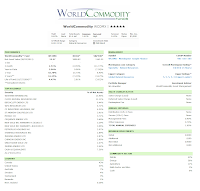 This WCOMX fund has 3 years of positive return since its inception, with the best 1-year total return in year 2009 with 38.07%. The only year with the negative return was in 2008 with -36.10%. It has 9.39% YTD return. This fund has returned 58.46% over the past year, and 18.19% over the past three years. The top holdings of this sector stock fund are Western Refining Inc (15.96%), Cliffs Natural Resources Inc (11.11%), Birchcliff Energy Ltd (9.44%), WPG Resources Ltd (6.71%), CF Industries Holdings, Inc (4.35%), St Andrew Goldfields Ltd (3.91%), Mosaic Co (3.71%), Cequence Energy Ltd (3.60%), New Gold Inc Warrants-A (3.29%) and New Gold Inc Warrants –B (3.06%). 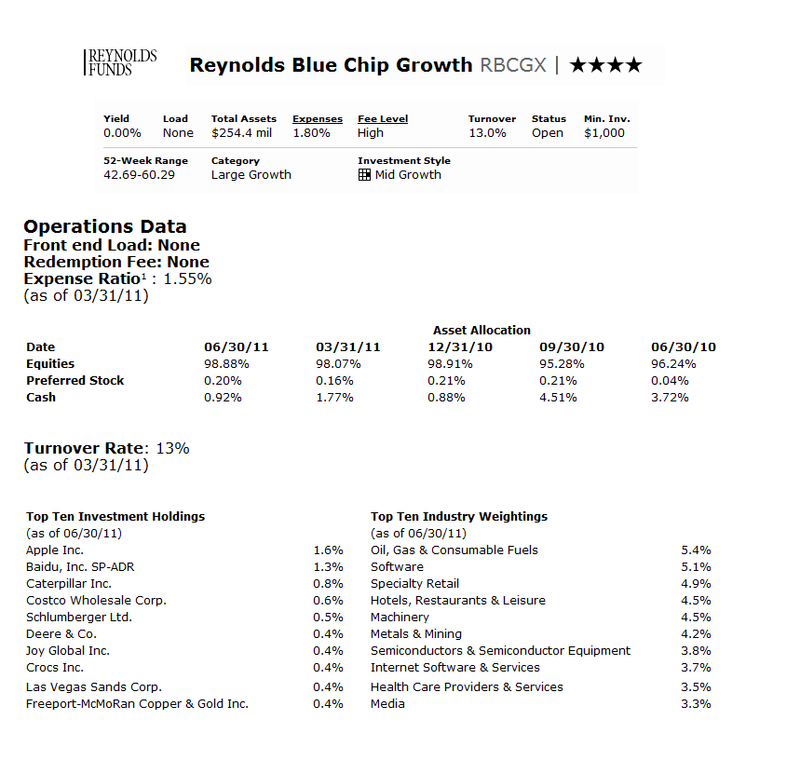 The Reynolds Blue Chip Growth fund’s objective is to seek long-term capital appreciation. The fund usually invests most of net assets (>80%) in the common stocks of well-established growth companies in their industries. These companies typically have a minimum market capitalization of at least $1 billion. It invests in securities of both domestic and foreign (through ADR) blue chip companies. This Reynolds fund doesn’t charge any sales load fee, but there is 12b1 fee of 0.09%. It also has an expense ratio of 1.80% per year. The average expense ratio in Large Growth category is 1.31%. This large growth stock fund has $254.4 million total net assets. The fund’s manager is Frederick L. Reynolds since 1988. Investor will need an initial investment of $1,000 to start investing in this Reynolds fund, for either brokerage or IRA account. Additional investment can be done with $100 or more. This RBCGX fund has experienced 14 years of positive return and 8 years of negative return. The best 1-year total return was occurred in year 1998 with 54.12% and the worst 1 year performance was occurred in year 2002 with -36.56%. Based on the load adjusted return, this fund has returned 25.60% over the past year and 4.09% over the past decade. 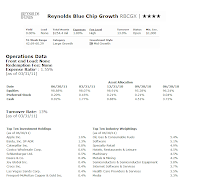 The top ten investment holdings of this Reynolds Blue Chip Growth fund as of June 2011 are Apple Inc (1.6%), Baidu Inc (1.3%), Caterpillar Inc (0.8%), Costco Wholesale Corp (0.6%), Schlumberger Ltd (0.5%), Deere & Co (0.4%), Joy Global Inc (0.4%), Crocs Inc (0.4%), Las Vegas Sands Corp (0.4%) and Freeport-McMoRan Copper & Gold Inc (0.4%). The Delaware Healthcare fund is to provide maximum long-term capital growth capital appreciation. The fund invests majority of assets (>80%) in the equity securities of health care companies. It invests in U.S. and non-U.S. companies across all market capitalizations (small cap, mid cap, and large cap). The fund may also invest in companies located in emerging markets. It is a non-diversified fund. Based on the load adjusted return, this health sector stock fund has returned 24.00% over the past year and 17.53% over the past three years. If you are interested in this fund, it can be purchased from 34 brokerages with $1,000 minimum initial investment for brokerage account. The other classes of this fund are Class C (Ticker: DLHCX), Institutional Class (Ticker: DLHIX) and Class R (Ticker: DLRHX). The top 10 holdings of this Delaware Healthcare fund out of 46 holdings are Google Class A Inc (6.7%), Bristol-Myers Squibb Co (6.3%), Boston Scientific Corp (6.0%), Smith & Nephew Plc (5.6%), Eli Lily & Co (5.2%), Yahoo! Inc (4.7%), Abbott Laboratories (4.6%), Aetna Inc (3.8%), Merck & Co Inc (3.7%), and Johnson & Johnson (3.5%). These top holdings represent 50.1% of the total portfolio. 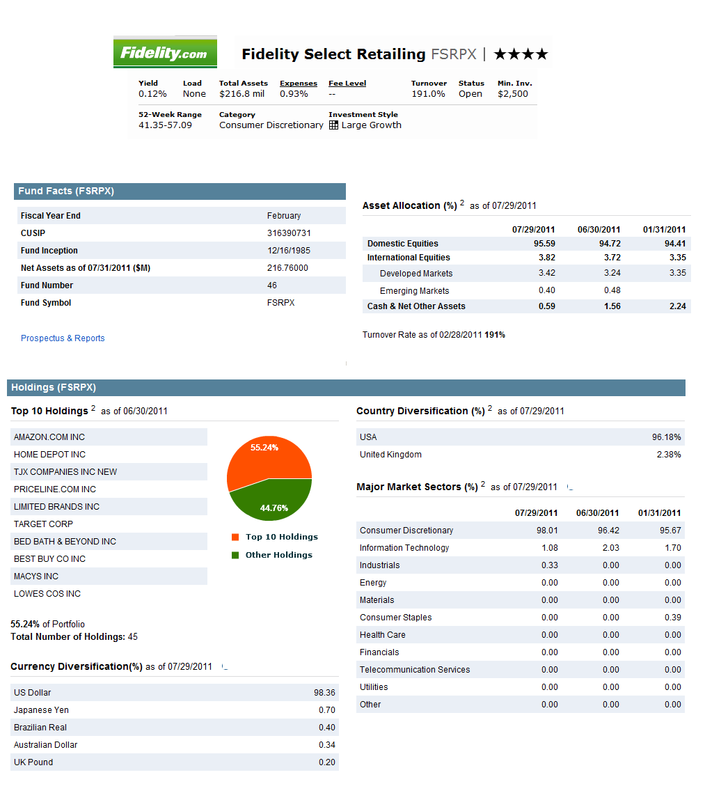 The Fidelity Select Retailing fund seeks capital appreciation. The fund normally invests in common stocks. It invests >80% of assets in stocks of companies engaged in merchandising finished goods and services primarily to individual consumers. This Fidelity sector stock fund invests in domestic and foreign issuers. The fund’s management will use fundamental analysis of factors such as financial condition, industry position, market and economic conditions, to select stocks for investment. This FSRPX fund is classified as Consumer Discretionary Fund. It has been introduced to public in December 16, 1985. The current lead fund’s manager of this Fidelity fund is Peter Dixon. Dixon has managed this fund since April 2010. This is a no-load fund, therefore there is no front end sales load fee or deferred sales load fee. There is as well no management fee. This fund shares a small dividend of 0.12% and the last dividend distributed was in April 2011 ($0.07). The yearly expense ratio of this fund is 0.93% while the average expense ratio in the category is 1.60%. To start investing in this fund, you will need a minimum of $2,500 for brokerage account and $500 for retirement (IRA) account. 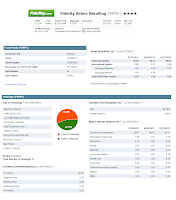 This Fidelity Select Retailing fund can be purchased from 65 brokerages. Since its inception, this FSRPX fund has recorded 17 years of positive return and 8 years of negative return. The best achievement was in 2009 with 57.82%. This fund has 5-stars Morningstar return rating. Based on load adjusted returns, this best domestic stock fund has returned 36.06% over the past year and 7.08% over the past decade. The YTD return of this Fidelity fund is 8.01%. 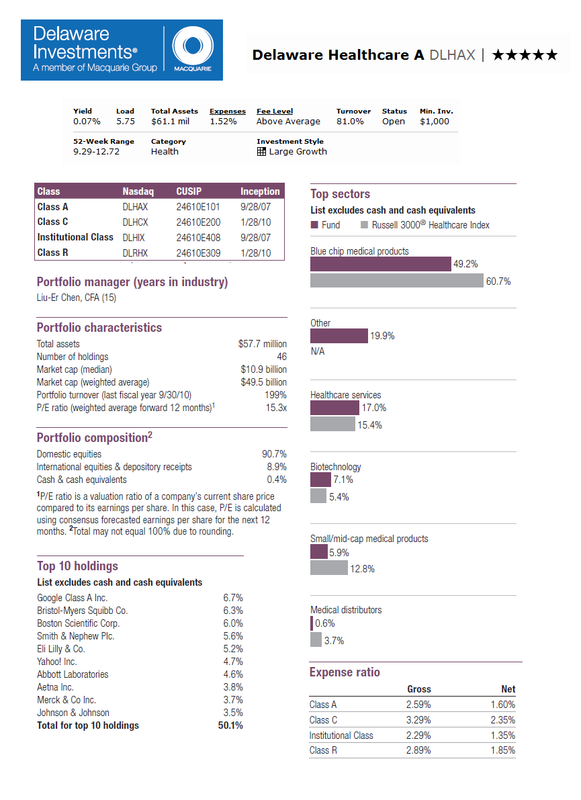 As of June 2011, this FSRPX fund has a total of 45 holdings. The top ten holdings represent 55.24% of the total portfolio. They are Amazon.com Inc, Home Depot Inc, TJX Companies Inc New, Priceline.com Inc, Limited Brands Inc, Target Corp, Bed Bath and Beyond Inc, Best Buy Co Inc, Macys Inc and Lowes Cos Inc. The Yacktman Focused fund will seek long-term capital appreciation and, to a lesser extent, current income. This fund invests in domestic and foreign equity securities and debt securities. It may invest some of assets (<20%) in foreign equity securities excluding investment in ADRs form. Its investments in equity securities may include common stocks, convertible stocks, preferred stocks, warrants, options, and ADRs. Debt securities can include U.S. Treasury notes and bonds, investment grade corporate debt securities, convertible debt securities and debt securities below investment grade. 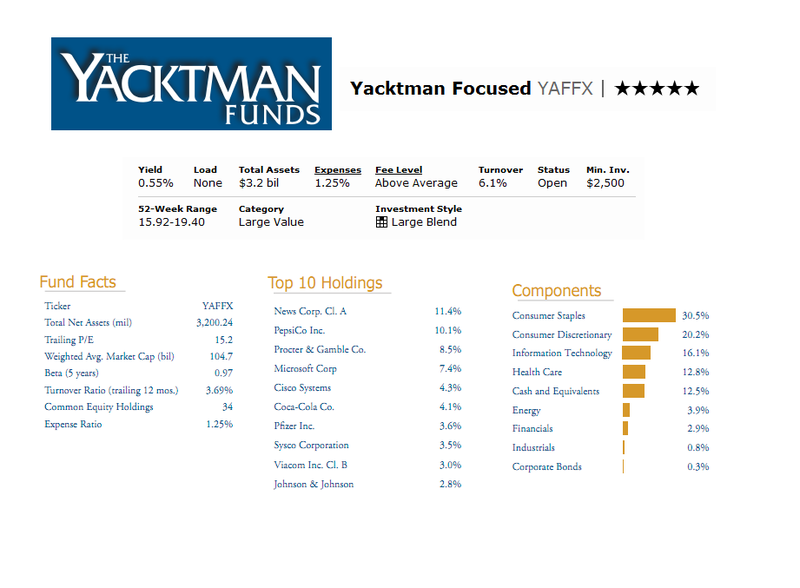 This Yacktman Focused Fund was introduced to public in April 1997. Donald Yacktman has managed this fund since 1992 then Stephen Yacktman joined this fund in December 2002. This Large Value fund has an annual expense ratio of 1.25%. This fee is comparable to the average in the category (1.27%). This YAFFX fund is a no load fund means it doesn’t charge any front-end sales load fee as well as no deferred sales load. There is also no 12b1 fee. The fund has total net assets of $3.19 billion. It requires a minimum of $2,500 to open a brokerage account in this fund. IRA account requires lower initial investment of $500. Both accounts request a minimum of $100 for the subsequent investment. There are 83 brokerages in which this fund can be purchased from such as JP Morgan, T Rowe Price, LPL SAM Eligible, E Trade Financial, Fidelity Retail Funds Network, TD Ameritrade Inc, Schwab Retail, Raymond James, Royal Alliance, Ameritas NTF, etc. 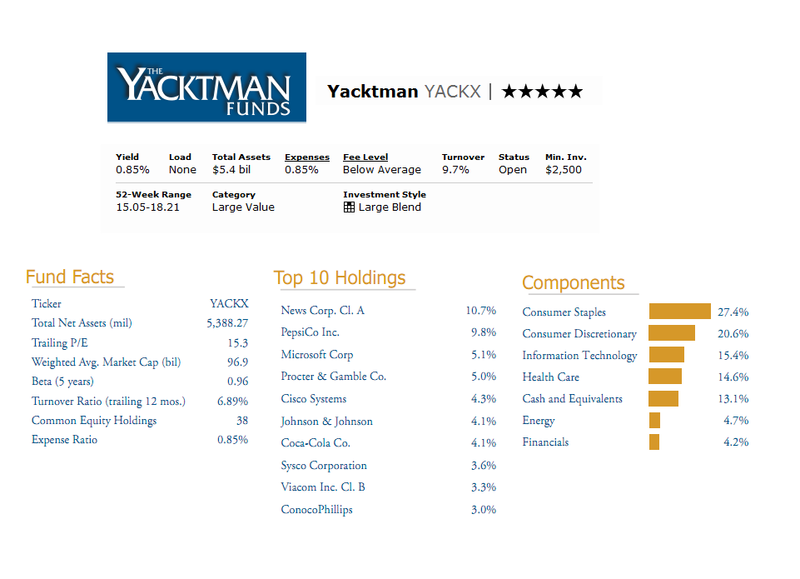 The top ten holdings of this Yacktman Focused Fund as of June 2011 are News Corp. Cl. A (11.4%), PepsiCo Inc. (10.1%), Procter & Gamble Co. (8.5%), Microsoft Corp (7.4%), Cisco Systems (4.3%), Coca-Cola Co. (4.1%), Pfizer Inc. (3.6%), Sysco Corporation (3.5%), Viacom Inc. Cl. B (3.0%) and Johnson & Johnson (2.8%). The top sectors or components are Consumer Staples (30.5%), Consumer Discretionary (20.2%), Information Technology (16.19%), Health Care (12.8%) and Cash and Equivalents (12.5%). The Firsthand Technology Opportunities fund’s objective is to provide long-term growth of capital. The fund typically invests > 80% of assets in growing high-technology companies. It may buy stocks of small-, mid-, and large-cap companies. The fund's investment portfolio includes younger companies with market capitalization in the small- or mid-cap categories. It is a non-diversified mutual fund. This fund has no management fee and no sales load fee. It charges 1.85% of annual expense ratio. The average expense ratio in the Technology category is 1.67%. This Firsthand is currently managed by Kevin Landis and Han M. Lee. The CUSIP of this fund is 337941504. To start investing in this TEFQX fund, either by opening a brokerage account or IRA account, investor will need a minimum of $2,000 for the initial investment. This Firsthand Technology Opportunities fund has 5-stars rating from Morningstar. It has -5.95% YTD return and 13.26% 5-year average return. Record shown that this TEFQX has performed in 7 years of positive return and 4 years of negative return since its inception in September 1999. The best 1-year total return was 73.98% (in year 2009). This fund has returned 20.35% over the past year based on load adjusted return. 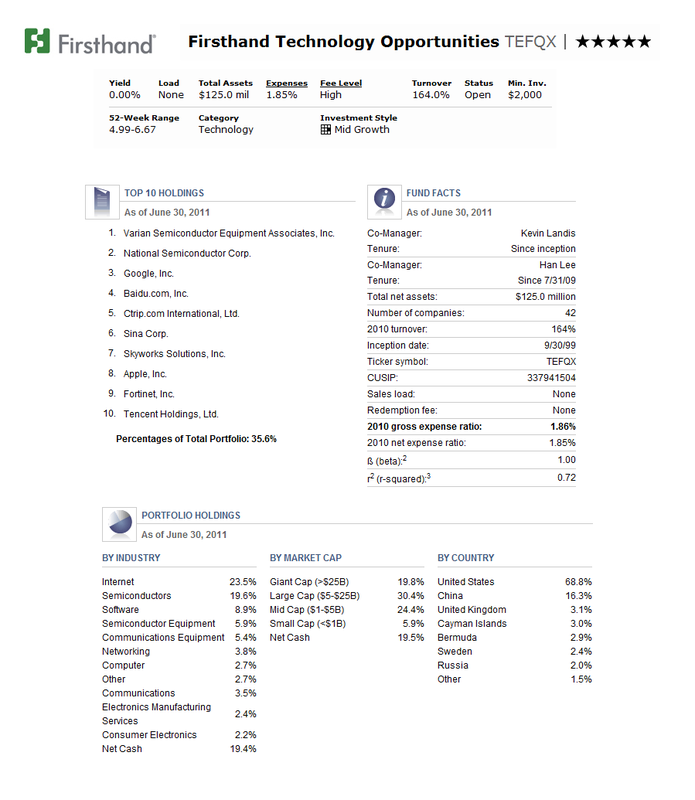 As of June 2011, the top ten holdings of this fund are Varian Semiconductor Equipment Associates Inc, National Semiconductor Corp, Google Inc, Baidu.com Inc, Ctrip.com International Ltd, Sina Corp, Skyworks Solutions Inc, Apple Inc, Fortinet Inc, and Tencent Holdings Ltd. These ten holdings represent 35.6% of the total portfolio. 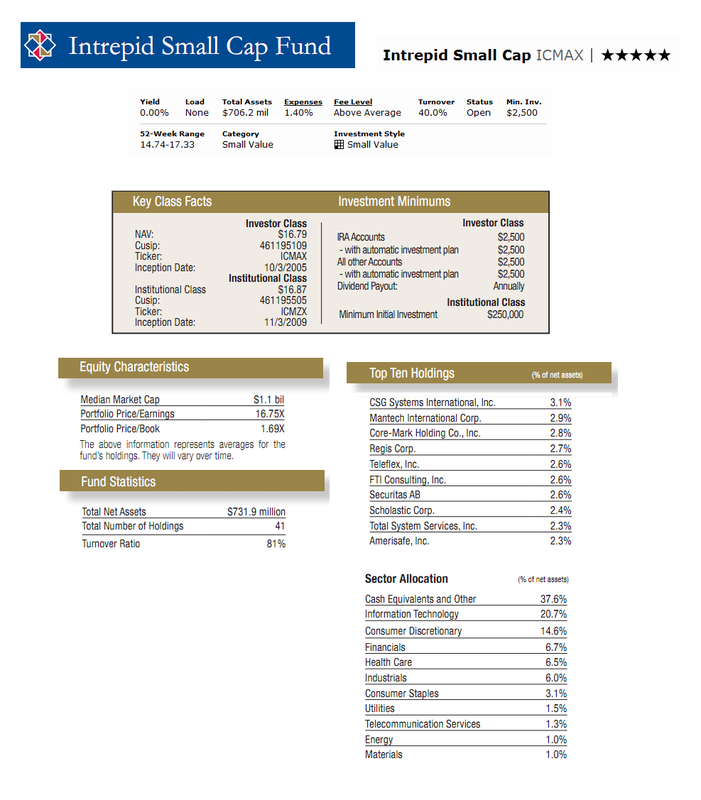 The Intrepid Small Cap fund is trying to provide long-term capital appreciation. The fund invests majority of net assets (>80%) in equity securities of small capitalization companies. It invests in undervalued equity securities and in internally financed companies generating cash in excess of their business needs, with predictable revenue streams, and in industries with high barriers to entry. The fund is non-diversified. 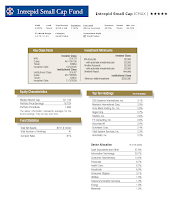 This Interpid Small Cap Fund was introduced to public in October 2005. Jayme C. Wiggins has been the lead fund manager of this fund September 2010. He is assisted by Mark Travis and Gregory M. Estes. This fund is classified as the Small Value stock fund. This top fund doesn’t have any dividend. The ICMAX fund charges 1.40% annual expense ratio. 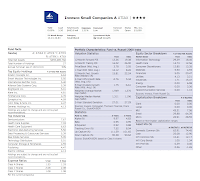 The annual expense ratio in the Small Value category is 1.47%. The 12b1 fee of this fund is 0.25%. There is no sales load fee for investing in this fund. 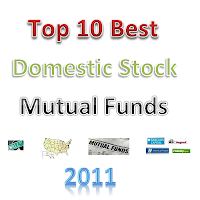 This fund has a total of 41 total holdings as of June 2011. The top ten holdings of this fund are CSG Systems International, Inc. (3.1%), Mantech International Corp. (2.9%), Core-mark Holding co., Inc. (2.8%), Regis corp. (2.7%), Teleflex, Inc. (2.6%), FTL consulting, Inc. (2.6%), Securitas AB (2.6%), Scholastic Corp. (2.4%), Total System Services, Inc. (2.3%) and Amerisafe, Inc. (2.3%). The Invesco Small Companies fund investment seeks long-term growth of capital. The fund invests most of net assets (>80%) in securities of small-capitalization. It invests primarily in equity securities. This Invesco fund may invest <25% of net assets in foreign securities and 10% of net assets in fixed-income securities such as investment-grade debt securities, longer-term U.S. government securities and high-quality money market investments. Robert Mikalachiki has managed this best fund since its inception in November 2003. The fund has total net assets of $683.81 million. 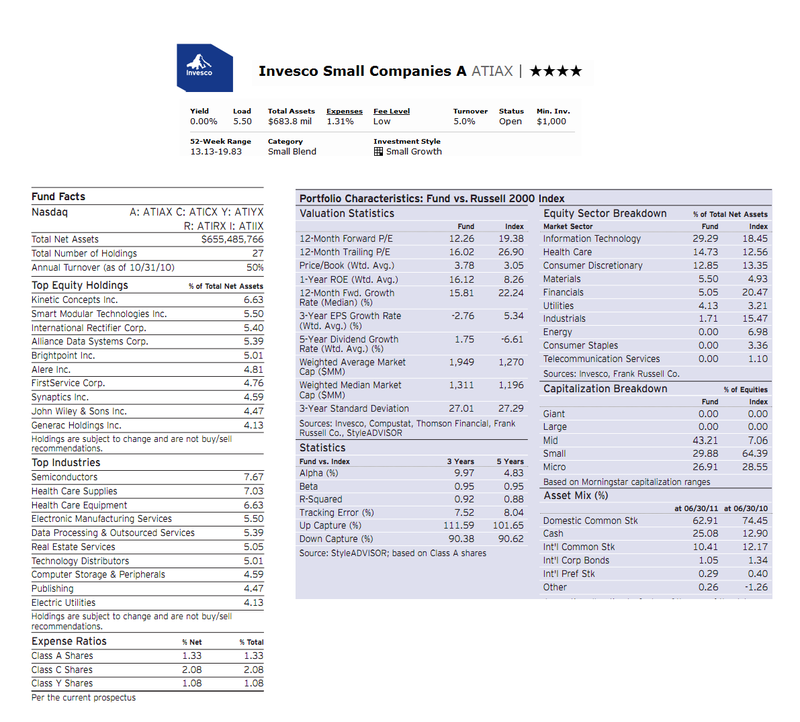 The average annual expense ratio in the Small Blend Category is 1.38% while the annual expense ratio of this ATIAX fund is 1.31%. The minimum amount needed to start investing in the brokerage account of this fund is $1,000 with $50 minimum subsequent investment. The 12b1 fee is 0.25% and the front-end sales load fee is 5.50%. Morningstar has rated this fund with 5-stars rating (i.e. the highest rating). Since its inception, it has 6 years of positive return and only 1 year of negative return so far. The worst 1-year total return was occurred in 2008 with -40.51%, and the best achievement was occurred in 2009 with 65.47%. The fund has 3.06% YTD return. Based on the load adjusted return, this fund has returned 26.80% over the past year and 7.86% over the past five years. Investor can choose from other classes of this fund such as Class C (ATICX), Class Y (ATIYX), Class R (ATIRX) and Class I (ATIIX). The expense ratio for Class C is 2.08% and 1.08% for Class Y. This fund can be purchased from 104 brokerages, like JP Morgan, Schwab Institutional, Prudential Retail, Merrill Lynch, Vanguard, Edward Jones, Td Ameritrade Inc, E Trade Financial, Morgan Stanley Advisors, etc. 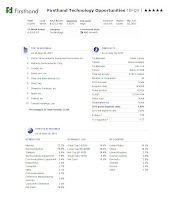 As of the second quarter of 2011, this Invesco fund has a total of 27 holdings. The top ten holdings are Kinetic Concepts Inc (6.63%), Smart Modular Technologies Inc (5.50%), International Rectifier Corp (5.40%), Alliance Data Systems Corp (5.39%), Brightpoint Inc (5.01%), Alere Inc (4.81%), First Service Corp (4.76%), Synaptics Inc (4.59%), John Wiley & Sons Inc (4.47%) and Generac Holdings Inc (4.13%). The Yacktman fund is seeking long-term capital appreciation and to provide income. The fund invests in both domestic and foreign equity securities and debt securities. It invests <20% of assets in foreign equity securities excluding investments in the form of ADRs. The fund's investments in equity securities may include common stocks, preferred stocks, convertible stocks, and ADRs. Its investments in debt securities may include U.S. Treasury notes and bonds, investment grade corporate debt securities, convertible debt securities and debt securities below investment grade (high yield bonds or junk bonds). This fund has 5-stars rating from Morningstar. Since its inception in July 1992, this Yacktman fund has been managed by Donald A. Yacktman. The fund has a dividend yield of 0.85%. The annual expense ratio of this fund is 0.85%. This fee is lower than the average in the Large Value category which is 1.27%. This fund doesn’t have any management fee or sales load. During his tenure, this fund has recorded 14 years of positive return and 4 years of negative return. The best 1-year total return was in 2009 with 59.31% and the worst return in year 2008 with -26.05%. Investor will need a minimum of $2,500 for the initial investment in brokerage account and $500 in IRA account. The minimum subsequent investment is $100. This fund can be purchased from 87 brokerages like JP Morgan, T Rowe Price, Schwab Retail, Dreyfus NTF, Fidelity Retail Funds Network, E Trade Financial, TD Ameritrade Inc, etc. The top 10 holdings out of the total 38 common equity holdings are News Corp Class A (10.7%), PepsiCo Inc (9.8%), Microsoft Corp (5.1%), Procter & Gamble Co (5.0%), Cisco Systems (4.3%), Johnson & Johnson (4.1%), Coca-Cola Co (4.1%), Sysco Corporation (3.6%), Viacom Inc Class B (3.3%), and ConocoPhillips (3.0%). The top 5 components or sectors are Consumer Staples (27.4%), Consumer Discretionary (20.6%), Information Technology (15.4%), Health Care (14.6%) and Cash and Equivalents (13.1%).